As a family we like to spend the weekends doing a little bit of what we all fancy. So on a Saturday morning we go to swimming lessons for Bubba and often then go do our supermarket shop. Hubby is always saying we need to get outside as soon as we get home because both kids really thrive on being in the garden. 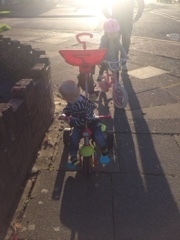 So this week we decided to go out for a late bike ride to enjoy the last of the sunshine. On Sunday we went to our nieces birthday party at softplay and the kids had the best time. 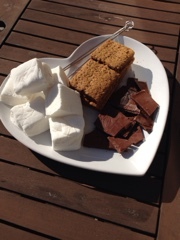 We then went and did some chores before coming home and deciding to have some S'mores in the garden. 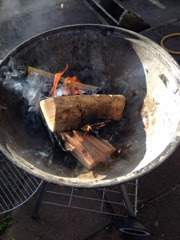 Bubba wants to go camping and toast marshmallows so we gave it a go (minus the camping bit until she's a bit older).We had been sent a brilliant kit from Certainly Wood but instead of making a proper campfire we used the BBQ. It was the best option with cub running around and his inability to notice danger. It was easy to light the wood and get ourselves going, the instructions were simple to follow and suggested making a wigwam shape to light it. Bubba was so excited to see the real flames leaping up out of the bbq base and wanted to get straight on to toasting marshmallows. Hubby managed to incinerate the first one - it was literally black and sort of crumbled if touched...not edible at all! We were sent some gourmet crackers, marshmallows and chocolate to test out and they were all beautifully wrapped and sent out to us. Having never made S'mores before I had to find out how to make them and apparently you need to break your cracker in half and put a piece of chocolate on. 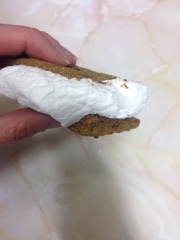 Toast the marshmallow and then put on your stack, squash down whilst still warm and enjoy. Luckily we had wood, starter lighters and flamers left over so will be doing this more often. Bubba loved the adventure of having a real fire in the garden and doing something we don't normally do. Cub just enjoyed the goey delight which went everywhere. We enjoyed something a little different and hope the evenings stay mild and dry for awhile longer so hubby and I can go out after the kids are in bed, enjoy a little wine and toast some more marshmallows. 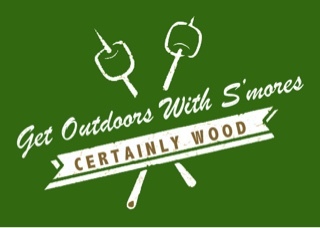 Our fabulous kit was from Certainly Wood - www.certainlywood.co.uk and there are lots of ideas over on their blog too for getting everyone outdoors. ps. I did have some lovely shots on my big camera too but it decided to give up the game halfway through our adventure and my battery has stopped working...until I can extract the photo's unfortunately my phone snaps will have to do.